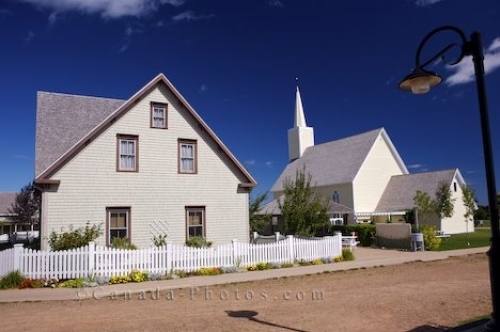 Under the dark blue skies of Cavendish, Prince Edward Island, tourists are welcome to wander through Avonlea, the village of Anne of Green Gables, for a journey back in time. Experience life as L.M. Montgomery did as a child, author of Anne of Green Gables, and participate in the adventures offered at this village. Picture of the buildings in Avonlea, the village of Anne of Green Gables in the town of Cavendish, Prince Edward Island.